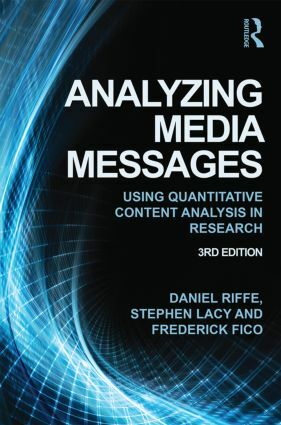 Analyzing Media Messages is a primer for learning the technique of systematic, quantitative analysis of communication content. Rich with examples of recent and classic applications, it provides solutions to problems encountered in conducting content analysis, and it is written so that students can readily understand and apply the techniques. This thoroughly revised third edition includes current and engaging examples for today's students, in addition to a number of historically important cases. It emphasizes communication of visual imagery and studies of advertising content. Resources on the book’s companion website provide additional materials for students and instructors, including existing protocols, web links, and a bibliography of content analysis methods articles. This volume is intended for use as a primary text for content analysis coursework, or as a supplemental text in research methods courses. It is also an indispensable reference for researchers in mass media fields, political science, and other social and behavioral sciences.